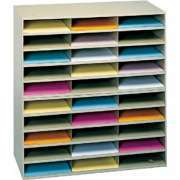 Looking for a great way to keep your papers organized? 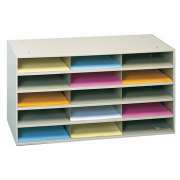 Hertz Furniture&apos;s literature organizers give you a place to sort all of the papers that don&apos;t seem to have a home. They come in a variety of configurations and sizes, so you can choose the best option for your teachers’ room, copy center or mailroom. Our literature sorters are a sure win against the war on clutter. They offer a great way to distribute papers and fliers to teachers, students or employees. The right choice will help your school or office run smoothly by providing a clear place for mail, forms, paychecks, personal correspondence and any other papers you have. What is a good way to organize teachers&apos; mail? 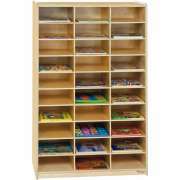 A literature organizer will make an excellent addition to your teachers&apos; room or staff lounge. 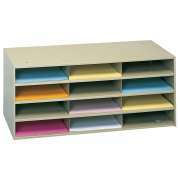 With so many compartments, you can easily give each teacher or employee a personal mailbox. With a clearly designated space, anyone who needs to return papers to any other employee can easily do so without having to spend time looking for them or finding an appropriate place. A teacher mailbox also offers a space for teachers to keep their own handouts in, or for students to hand in assignments. How can I keep student papers organized? Literature sorters don&apos;t just have to be for adults, they are also convenient in the classroom. They can be used to keep student papers sorted to ensure that corrected assignments are returned to the right person. When each student knows that they have a personal compartment to check before the end of every school day, teachers can be sure that all permission slips and newsletters make their way to the appropriate destination. 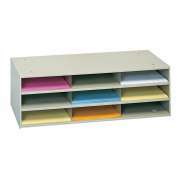 Personal cubbies also make it easier to keep track of whose papers are whose. They are definitely worth considering when choosing your classroom layout. Does your office school or church have a copy center? If you have an employee who is designated to make copies for others, it is important to provide an efficient system such as a literature organizer for returning completed copy and print jobs. If all sets of papers are simply stacked in one place or left in various piles, it is easy for them to get knocked over, damaged or mixed up. With all separate jobs in the individual compartments of a wood mail sorter, employees can quickly locate their complete undamaged sets of papers or projects. 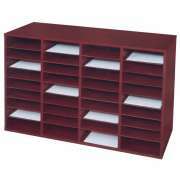 What kind of mail sorter should I get? Teacher mailboxes come in a lot of different styles. 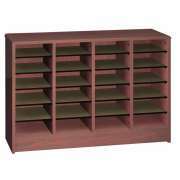 They include a set number of shelves, so you should think about how many compartments you need before choosing one. In case you need an extremely high capacity of teachers mailboxes, many of our units can be mounted on top of each other to help you get the perfect number of spaces. 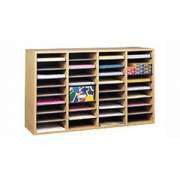 You can designate a whole wall for teacher mailboxes, or just enjoy the convenience of one unit. Although units come with a particular number of shelves, many of them can be modified based on your needs. 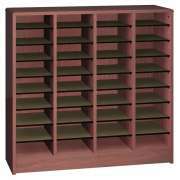 Some mail organizers feature adjustable shelves, so you can make compartments of different sizes depending on what you need them for. 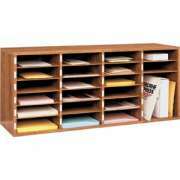 If you need much larger spaces, some mail sorters have removable shelves so you can arrange a truly custom configuration. This is a great setup if you want to use some shelves for items other than papers. How should I label teacher mailboxes? If your company or school has a lot of employees, it is important to make sure that your literature sorters are clearly labeled. That way, if the payroll office needs to give an important document to a certain person, it is easy for them to do so. 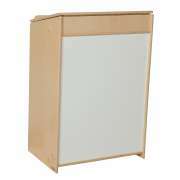 Labeled cubbies also ensure that people won&apos;t mistakenly put papers in the wrong place, especially if they contain sensitive or private information. Teachers&apos; mailboxes come in a lot of different materials. Steel literature organizers from Durham are super tough. Steel won&apos;t warp or bend, so they are guaranteed to stay in great shape for many years. 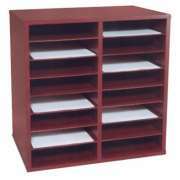 We also offer Norsons models which are constructed from ⅝”-thick particleboard with a laminate finish in a choice of professional hues, which are great if you want to broaden your classroom colors. 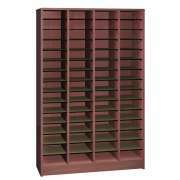 Ironwood Manufacturing has attractive units with sturdy hardboard shelves. 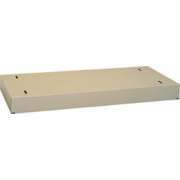 If you prefer a more natural look and healthy materials, we have birch plywood mailboxes from Wood Designs. While a literature organizer is convenient on its own, there are a number of additional options that can make it even more attractive. Durham all-steel units have an optional base which provides extra stability. If you aren&apos;t going to have compartments going all the way up to the ceiling, it is worthwhile to consider finding a functional use for the top surface, especially if it rests at shoulder height. 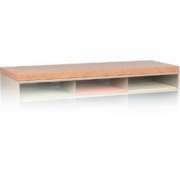 Durham also offers an optional laminate top which provides an attractive finish and a functional writing surface. 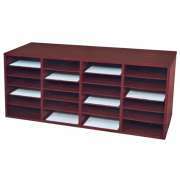 Hertz Furniture&apos;s mail organizers are designed to help your company or institution run smoothly. 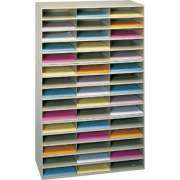 Whether you use our mailroom sorters in the teachers&apos; room, copy center, classroom or anywhere else, they are sure to facilitate organization. Not sure which model or material will best suit your space? Call the Hertz Project Solutions team today and we will be happy to assist you with selection, ordering and installation.